Among global issues of the twenty-first century are: population growth, increase in energy demand, enrichment of atmospheric concentration of greenhouse gases (GHGs) and the attendant climate change, increase in food production needed to meet the demands of growing and increasingly affluent population, and aggravated risks of soil and environmental degradation. 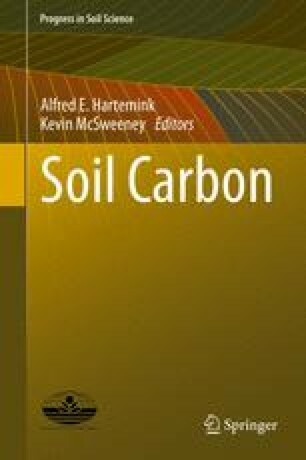 Thus, enhancing the magnitude and mean residence time (MRT) of soil carbon (C) pool is integral to any strategy of addressing these and other related global issues. The promise of soil C sequestration is based on the magnitude of net biome productivity (NBP) of ~3 Pg C/year, and the hypothesis that some of the NBP can be retained in the soil to offset emissions and also enhance the resilience of soil and agroecosystems to climate change. Complementary to soil organic C (SOC) is soil inorganic C (SIC) pool, together estimated at ~4,000 Pg to 3-m depth, and play a major role in the global C cycle (GCC). The soil C sink capacity has been enhanced by depletion of the antecedent SOC pool in degraded soils. Despite the large potential of 0.5–1 Mg C/ha/year, there are numerous uncertainties: (1) increased emissions of GHGs with increase in the atmospheric concentration of CO2 because of accelerated decomposition and erosional processes, (2) change in the rate of C uptake in soils of the tropics by climate change, (3) impact of chemical weathering of silicate rocks in altering terrestrial sinks, (4) unknown fate of C transported by erosional processes, (5) a possible positive feedback from the melting of permafrost, (6) decrease in capacity of terrestrial sinks because of soil degradation, and (7) the effects of wild/managed fires on soot, charcoal and NBP. These uncertainties interact with mechanisms of SOC stabilization and those which enhance its MRT. These mechanisms include: physical protection through deep placement and formation of stable aggregates, interaction between SOC and clay minerals, landscape position, and humification leading to formation of recalcitrant fractions. There is a vast potential of SOC sequestration through adoption of recommended management practices on croplands (e.g., conservation agriculture, cover cropping, integrated nutrient management) grazing lands (e.g., controlled grazing, better forage/tree species, soil and water conservation), forestlands (e.g., afforestation, stand management, species selection), wetland/peatland restoration, and reclamation of degraded soils. Comparatively low rate of SIC sequestration as pedogenic carbonates exist in vast arid and semi-arid lands, and in agroecosystems irrigated with good quality water. However, there are also challenges of credible measurements of small changes in soil C in a relatively large pool, and of scaling up the data from profile to watershed and regional scale. There are numerous co-effects of soil C sequestration including improvements in soil quality, increase in agronomic productivity, enhancement of biodiversity, reduction in non-point source pollution etc. Payments to land managers for ecosystem services and trading of C credits may enhance adoption of recommended technologies especially by resource-poor farmers, and small landholders in the tropics. Researchable priorities include understanding of trends and variability in principal determinants of SOC pools and its MRT, assessing the impact of C-climate feedbacks and understanding coupled cycling of C with other elements (N, P, S) and H2O. Soil C sequestration has a finite sink capacity. However, it has numerous co-benefits (e.g., food security), and is a cost-effective, win-win option, and a bridge to the future until low-C or no-C fuel sources take effect.